Our Turkey & Pumpkin Milky Way Soap Mold features detailed images of a turkey and a pumpkin with a few ears of corn. These classic fall images are great for Thanksgiving or harvest celebrations. 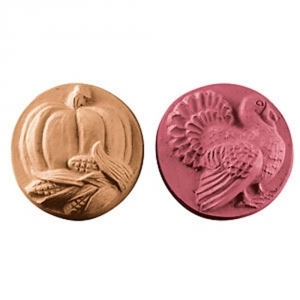 Soap Bar Dimensions: 2.75" x 1"
Notify me when Turkey & Pumpkin Soap Mold is in stock.